The most luminous galaxy known in the Universe — the quasar W2246-0526, seen when the Universe was less than 10% of its current age — is so turbulent that it is in the process of ejecting its entire supply of star-forming gas, according to new observations with the Atacama Large Millimeter/submillimeter Array (ALMA). Quasars are distant galaxies with very active supermassive black holes at their centres that spew out powerful jets of particles and radiation. Most quasars shine brightly, but a tiny fraction  of these energetic objects are of an unusual type known as Hot DOGs, or Hot, Dust-Obscured Galaxies, including the galaxy WISE J224607.57-052635.0 , the most luminous known galaxy in the Universe. For the first time, a team of researchers led by Tanio Díaz-Santos of the Universidad Diego Portales in Santiago, Chile, has used the unique capabilities of ALMA  to peer inside W2246-0526 and trace the motion of ionised carbon atoms between the galaxy’s stars. “Large amounts of this interstellar material were found in an extremely turbulent and dynamic state, careening throughout the galaxy at around two million kilometres per hour,” explains lead author Tanio Díaz-Santos. The astronomers believe that this turbulent behaviour could be linked to the galaxy’s extreme luminosity. W2246-0526 blasts out as much light as roughly 350 trillion Suns. This startling brightness is powered by a disc of gas that is superheated as it spirals in on the supermassive black hole at the galaxy’s core. The light from the blazingly bright accretion disc in the centre of this Hot DOG does not escape directly, it is absorbed by a surrounding thick blanket of dust, which re-emits the energy as infrared light . This powerful infrared radiation has a direct and violent impact on the entire galaxy. The region around the black hole is at least 100 times more luminous than the rest of the galaxy combined, thus releasing intense yet localised radiation in W2246-0526 that is exerting tremendous pressure on the entire galaxy . “We suspected that this galaxy was in a transformative stage of its life because of the enormous amount of infrared energy,” said co-author Peter Eisenhardt, Project Scientist for WISE at NASA's Jet Propulsion Laboratory in Pasadena, California. 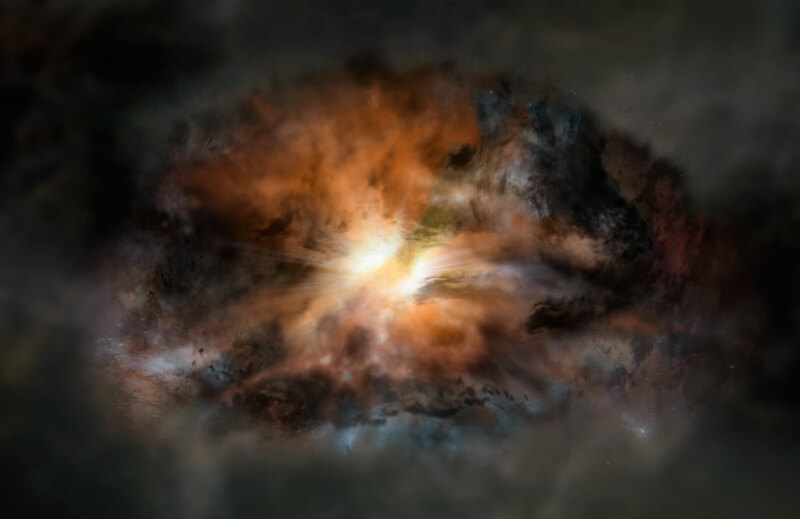 “ALMA has now shown us that the raging furnace in this galaxy is making the pot boil over,” adds Roberto Assef, also from Universidad Diego Portales and leader of the ALMA observations. If these turbulent conditions continue, the intense infrared radiation would boil away all of the galaxy’s interstellar gas. Models of galaxy evolution based on the new ALMA data indicate that the interstellar gas is already being ejected from the galaxy in all directions. Only one of every 3000 quasars observed are classified as Hot DOGs. The full name of this remarkable object is WISE J224607.57-052635.0, it was found by NASA’s Wide-field Infrared Survey Explorer (WISE) spacecraft and the rest of the name gives the precise location of the quasar on the sky. ALMA is uniquely capable of detecting the faint, millimetre-wavelength light naturally emitted by atomic carbon. Because of the expansion of the Universe the infrared radiation from W2246-0526 is redshifted to longer millimetre wavelengths — where ALMA is very sensitive — when it is observed from Earth. In most other quasars this ratio is much more modest. This process of mutual interaction between the central black hole of a galaxy and the rest of its material is known to astronomers as feedback. This research was presented in a paper "The Strikingly Uniform, Highly Turbulent Interstellar Medium of The Most Luminous Galaxy in the Universe”, by T. Díaz-Santos et al., and will be published in the journal Astrophysical Journal Letters. The team is composed of T. Díaz-Santos (Universidad Diego Portales, Santiago, Chile), R. J. Assef (Universidad Diego Portales, Santiago, Chile), A. W. Blain (University of Leicester, UK) , C.-W. Tsai (Jet Propulsion Laboratory, California Institute of Technology, Pasadena, California, USA) , M. Aravena (Universidad Diego Portales, Santiago, Chile), P. Eisenhardt (Jet Propulsion Laboratory, California Institute of Technology, Pasadena, California, USA), J. Wu (University of California Los Angeles, California, USA), D. Stern (Jet Propulsion Laboratory, California Institute of Technology, Pasadena, California, USA) and C. Bridge (Jet Propulsion Laboratory, California Institute of Technology, Pasadena, California, USA).